AmericanFlags.com proudly features city flags in sizes 3' X 5' to 8' X 12'. 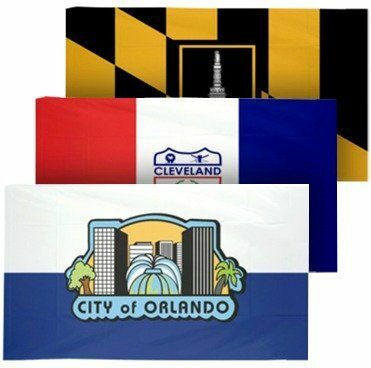 We carry city flags for many major American cities including Denver, Dallas, Los Angeles, New York and Chicago. These flags are carefully constructed in heavy duty nylon and feature brass grommets for easy display. All of our city flags are made in America and most are made-to-order. Delivery time on our city flags is approximately ten days. Please contact us if you need a city flag sooner or if you'd like to place a bulk order as we cheerfully offer volume discounts.